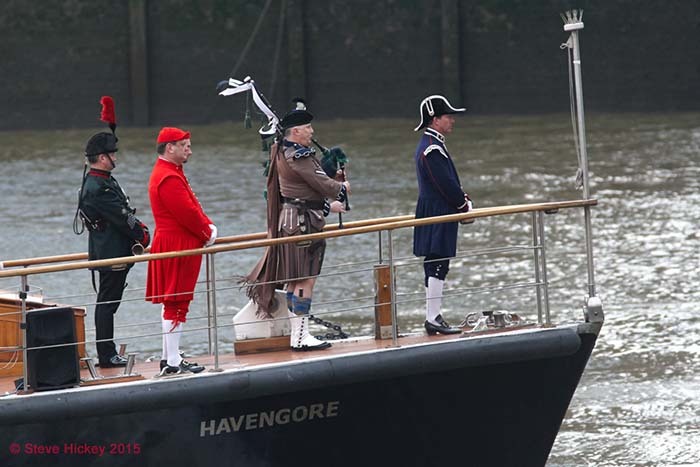 The ceremonial guard at the front of the Havengore. Back in the city today and I managed to get down to the river to get a few shots of the start of the ceremonial event for the anniversary of Winston Churchill’s funeral. I remember watching the funeral on TV when I was young and that kind of thing always sticks in the memory so it was interesting to see a recreation of the event. The boat which originally carried his coffin, 50 years ago today, retraced the route along the Thames – so I thought that I would go and get a few shots for stock. I know the area really well and had a place in mind to shoot from but as I couldn’t get down there until 45 minutes before the event I thought maybe I might have a struggle with crowds – but only a few tourists were around. Even when the boat passed the crowd was very light and also not many photographers were near my position – always a good thing! Weather was good, bit of hazy sun and not too cold. The boat moved pretty quickly, much quicker than I expected, and from my position it was all over in a few minutes. I had quite a few shots in the bag so as the boat moved on I packed up and headed for the station. The fact that there weren’t big crowds did kind of make me wonder about the relevance of the anniversary for the average person on the street. There’s been a lot of media focus on the anniversary, a lot of stuff on TV, and for those closely involved it’s obviously an emotional event, but as for the general public – many don’t seem to take much notice. I found that there’s a few commemorative things going on including an exhibition at the Science Museum which runs until 2016. There’s also a General Election coming up in a few months – but whatever any of us might think of Churchill, it would be a shame if the anniversary of the death of a major world statesman were to be hijacked for political reasons. That wouldn’t happen would it? The photograph above taken with a Canon 1D3 with 300mm f4 and 1.4x converter.